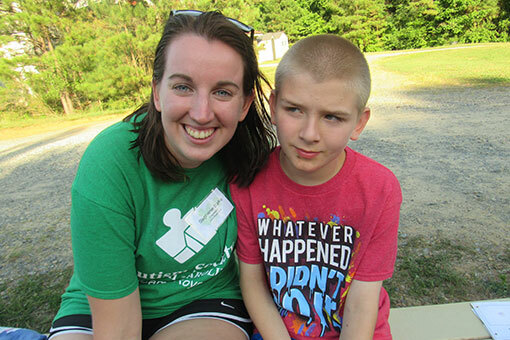 Working at the Autism Society of North Carolina’s Camp Royall is an eye-opening experience filled with fun, lifelong friendships, and an amazing feeling of accomplishment. After working at camp, you will find you are stronger, more patient, more confident, and more compassionate than the day you started. Openings depend upon the time of year. For Summer Camp, we hire Residential Camp Counselors, Day Camp Counselors, Lifeguards, Cooks, and Nurses. At other times of the year, we hire part-time Counselors. All of our staff members must be 18 or older. Most of our staff are college students or work in the school system, but neither is a requirement. Former staff members have been able to earn college credit by setting up internships and practicums at camp. This process is initiated by the student, but we are happy to help. It is very important to us that our staff are well-trained and receive proper support. All new staff members attend a week of training before Summer Camp and receive ongoing supervision. Staff members learn about autism and strategies for working with the individuals we serve. Our trainers are professionals with extensive experience and knowledge in the field of autism. Low counselor-to-camper ratios are crucial to the success of Camp Royall. Our ratios are typically 1:1 or 1:2. The primary responsibilities of our Counselors include encouraging campers through the scheduled activities and assisting and supporting in areas of communication, social interaction, behavior and self-care. All staff members must have complete references, an interview, and a background check before being hired. No experience with autism is required to work at Camp Royall, the most important things we look for in staff are the right attitude, a willingness to learn and a lot of enthusiasm! Our staff members are off from late Friday afternoon until early Sunday afternoon. Supervision in camper cabins at night is rotated so that each staff member will have the night duty shift for two weeks during the summer; the rest of the weeks, staff are off all nights. Further compensation includes free room and board at camp and a week of training. Day Camp Counselors work from 9 a.m. to 5 p.m. Monday through Friday. Additional hours will be required each week for staff meetings. Day Camp Counselors do not receive room or board at camp. A week of training is also provided. Our Afterschool Program runs in the fall and the spring each school day from 2 p.m. until 6 p.m. We are looking for staff members who can commit to working 2-4 days per week. Counselor-to-camper ratios are typically 1:2 or 1:3. All new staff members will do training, shadow, observe, and have lots of opportunities to ask questions before having responsibility for our participants. The program closes in mid-May for the summer season and resumes in late August, ideal for those who might also want to work with our Summer Camp program. For Mini Camp Weekends, staff are required to arrive at 4:30 p.m. Friday evening to start the weekend. The campers leave on Sunday at 12 noon, and you will be finished working very soon after. Staff members work until about 8:30 p.m. each night and start at 8:30 a.m. each morning. During your first training weekend, you will be required to arrive around 1 p.m. on Friday to complete training before the weekend begins. For our week-long residential camps, we recruit alternative break groups. Volunteers work directly with our campers and support our leadership staff to set up and run activities. Contact us if you have a group that may be interested.